The 75 Morton success story of community activism is well known by now. It was a 10-year journey by parents and community leaders to pressure city and state officials to provide a desperately needed middle school in the Village. The tireless group identified the Morton St. building — which was partially occupied by a state agency that was being relocated — and convinced local politicians to champion the cause. In the mid 2000’s, local parents organized around concerns that elementary schools in District 2 were overcrowded. They believed this could only mean overcrowding in middle schools in the years to come. In 2008, they eyed the building at 75 Morton St. as a potential site for a new middle school, and started rallying support from the community and local elected officials - most notably City Councilmember, now Speaker, Corey Johnson, who represents District 3, Assemblymember Deborah Glick and state Senator Brad Hoylman. But the building was owned and being used by the state Office for People with Developmental Disabilities. Transferring ownership to the city Department of Education took years and involved messy politics - until then-City Council Speaker Christine Quinn announced in 2012 that an agreement had been reached to transfer the building and convert it to a school. The 75 Morton Community Alliance was born - a coalition of parents from School District 2 elementary schools committed to working in tandem with Community Board 2 and Community Education Council District 2 to aid in planning the new school. The Alliance hosted a series of “envisioning meetings” over two years with a two-part goal: first, working with the Department of Education and the School Construction Authority to help inform the construction process; and then, gathering parent input on critical issues, such as admissions criteria, desired qualities of the principal, and programming for both the middle school and District 75 school. 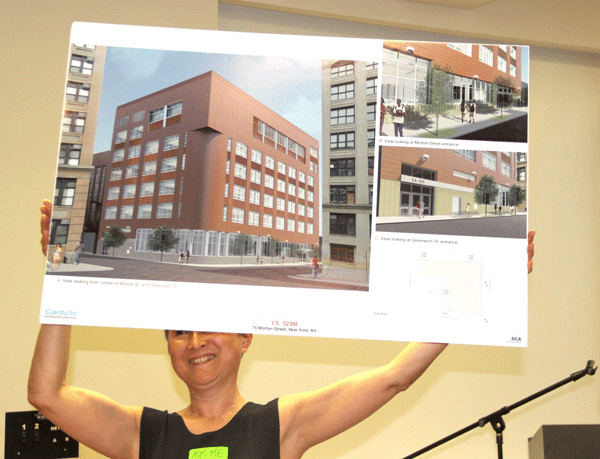 At one of many community meetings, Shino Tanikawa, then President of Community Education Council for District 2, held up a design rendering of the exterior of 75 Morton St.
As with all new public schools in NYC, 75 Morton includes up to 100 District 75 students on one dedicated floor. All of the school’s students share the cafeteria, gym, library and the building’s other common spaces. The process was further delayed when the OPDD was unable to move to their new home in Lower Manhattan until 2014 due to damage by Hurricane Sandy. The original goal of opening the school in 2015 became impossible, as construction did not begin until late that year. In the summer of 2016, the Department of Education named Jacqui Getz principal, giving her a full year to launch the new school. This lengthy prep time was in direct response to community actions. Getz brings 30 years of experience as a teacher, literacy expert, assistant principal at P.S. 234, principal at P.S. 290 and, most recently, principal of P.S. 126 / MAT a pre-K-to-eighth-grade school in Chinatown. She pledged to implement an inquiry- and project-based curriculum and hire teachers experienced at supporting and challenging a diverse range of students. But the planned Fall 2017 opening was further delayed by unforeseen construction delays at the new building, and M.S. 297 - as it was now called - had to be co-located at the nearby Clinton School on Union Square for the 2017-18 school year. Finally, in September 2018, M.S. 297 moves into its permanent home at 75 Morton St., a 177,000-square-foot, seven-story handicap-accessible building. In addition to classrooms, science labs, art and music rooms, facilities include a ground-floor, light-filled cafeteria, library and double-height “gymatorium,” with retractable seating, fitness and dance studios, and outdoor play yard. M.S. 297 also will have a green roof, thanks to $500,000 from Assemblymember Deborah Glick, City Council Speaker Corey Johnson and Borough President Gale Brewer. For 10 years, the community pushed for a new middle school and weighed in on the building’s purchase, configuration of grades, school building design, educational philosophy, admission methods, community partnerships, after-school programs and the school’s name. Going forward, the hope is that D.O.E. will embrace the 75 Morton model of local community engagement and input for how the city sites, designs and envisions new public schools. Community involvement in the genesis of 75 Morton has been unprecedented – and will remain central to its identity and culture as the school continues to grow.